I have learned so much from this wonderful book, the technique for making this Italian soup being one of them. 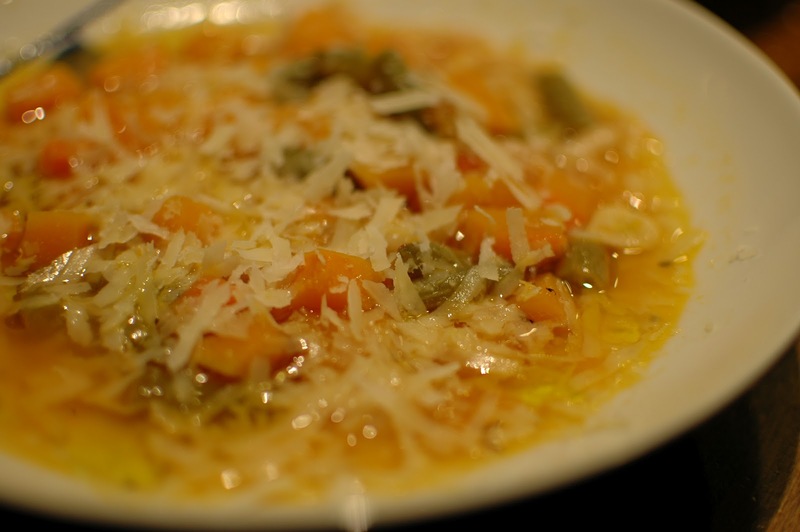 Minestrone means "big soup" in Italian. I am trying hard to know more in the kitchen, to know the techniques for doing something and not just blindly follow recipes one after another without knowing why or getting anywhere. It's more relaxing in the kitchen and also empowering to know by heart the technique (the sequence, key ingredients, and basic quantities or proportions) for how to roast vegetables, make risotto, or make minestrone, than to have to look up a recipe each time. So I love that Alice (I'm such a big fan, we're sort of on a first-name basis) writes an essay about each technique in her book first. For minestrone: "...First a tasty soffrito (a base of aromatic vegetables) is made, long-cooking vegetables are added and moistened with water or broth, and the soup is brought to a boil, at which point the more tender vegetables are added. Dried beans and pasta at cooked separately and added at the end." I almost feel from her teaching that I could be brave enough to walk into the kitchen and cook up some minestrone just from that paragraph. Of course, the recipe she obligingly includes after the essay is helpful as well. 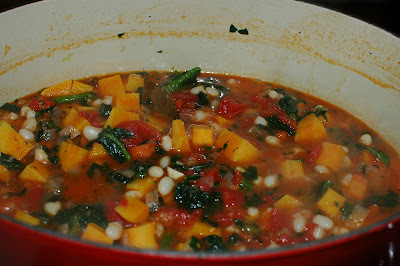 I can't talk about my relatively newfound love for minestrone-- and for making minestrone-- without mentioning another book I really like and refer back to periodically (with its foreword by Alice Waters), called An Everlasting Meal: Cooking with Economy and Grace (does that not sound like how you want to be in the kitchen? ?-- more on that book another time). Tamar Adler writes: "Minestrone is a precisely seasonal soup: it should reflect the season inside and outside your kitchen at all times. The beans you have cooked will always be at its center, but the rest will change throughout the year." I love that, and I always remember the "precisely seasonal" piece when making this soup. You can make it a dozen different ways throughout the year and never have the same meal twice. Every combination of vegetables I have used that I have had from my garden, my CSA, my winter farmers' market, or my freezer or pantry has been completely and utterly satisfying and left me thinking, this is what soup is meant to be. Tamar Adler also helped me be comfortable with the very homey and satisfying "skill" of soaking and cooking and using dried beans. Soak 1 C dried cannellini or borlotti beans overnight or for the day. Cover well with water, cover pot, and set aside. I do this in my smaller, round Le Crueset pot. Drain the beans, add plenty of fresh water (you'll be adding a cup or more of this liquid to the finished soup). Bring to a boil. Then turn the heat down to just below a simmer and let it go for a good hour, until beans swell up, skins loosen, and as Adler writes, "they are velvety to their absolute middles. You should feel, as soon as you taste one, as though you want to eat another. The whole pot is only ready when five beans meet that description. If one doesn't, let the beans keep cooking." Turn off, and set aside whole pot with beans and liquid. This can be done ahead and refrigerated or frozen, keeping beans and liquid together. (This constitutes the soffrito, which is a word I enjoy saying almost as much as minestrone, perfetto!, and Montepulciano... Soffrito could also include celery.) See tasty soffrito on left and beans cooking on right. Add 3 C water and bring to a boil. However, I am feeling so empowered in the kitchen these days that I keep this general quantity of veggies in mind and substitute freely with the best of the vegetables I have, keeping in mind a mix of colors for the final product. Last night we used at this step 3/4 lb.+ green beans in 1-inch lengths and 2 chopped tomatoes. Other variations could include combinations of: canned whole peeled tomatoes, chopped; chopped peeled butternut squash or sweet potatoes, frozen cut green beans, asparagus in 1/2-inch thick pieces on the diagonal, shelled or frozen peas, turnips, potatoes. Taste for salt. It will very likely need more. Lots of times in fall and winter we did use spinach, and frozen chopped worked beautifully. Last night, instead of spinach, we separately cooked until tender (not long) in boiling salted water a 1/2 head of cabbage in bite-size pieces and added that, drained, at this stage. Its tenderness was just right, as even my two-year-old ate it happily, and I usually don't expect him to eat any "leaves." If soup is too thick, add more bean liquid. Remove bay leaf. At the table, garnish bowls with grated Parmesan cheese and drizzles of olive oil. Perfetto! Another winter version below. I think this was frozen chopped squash, frozen chopped spinach, and canned tomatoes.